No I am not talking about apple the company but about the amazing fruit. I decided I wanted to do some more macro photography today and there just happened to be a fruit basket. I photographed all sorts of fruits but this one of an apple turned out best. 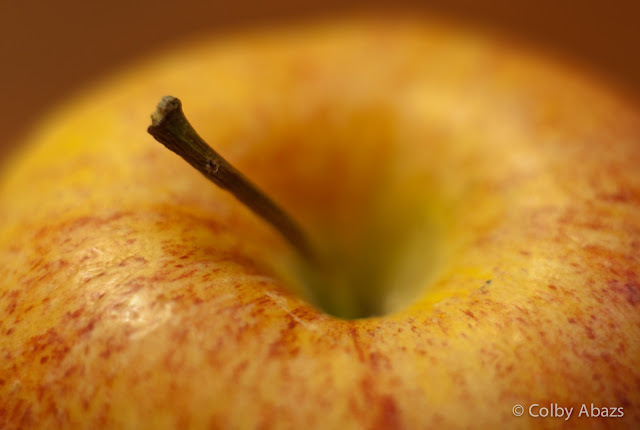 I like the extremely shallow depth of field and how that highlights the texture of the apple and the dark stem. After the fact I realized I should have tried out my newest photography tool a spray bottle. It would have added neat water droplets, well maybe next time.